Screenshot from the opening of the game. Jet Force Gemini is a game made by Rare for the Nintendo 64. 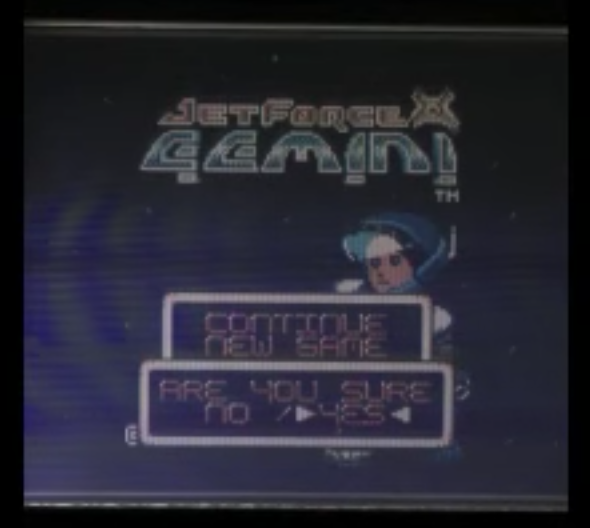 A Game Boy Color version of Jet Force Gemini was in development by Bit Studios (for Rare) in 2000 but was cancelled and never officially announced. Little is known about the game beyond this. This port was expected to have an isometric 2D view, which would be similar to the N64 version. The composer of the game was Jeroen Tel, a Dutch composer and video game pioneer. According to an interview with Martin Wakeley, the game was nearly finished when it was cancelled at the last minute. A video was uploaded to YouTube by a user named "Gameboy Color" which shows the introduction to the game. Few details beyond this were provided by the user other than the fact that this footage is "ultra rare" and that the user was playing it on a Game Boy Advance SP. The same user later uploaded around 6 minutes of gameplay footage. The entire soundtrack for the game was uploaded to YouTube and compiled into a playlist by user DevEd8 VGM. The description for the playlist contains a link to download a GBS file of the game's music. Footage of the introduction of the port. 6 minutes of gameplay footage. Track 1 of the game's soundtrack. YouTube playlist of the game's soundtrack.